la elección de los fans: Yes. "If tu I I not married por we are 40 how about we get together and make 1"
Which kiss do tu consider to be Mondler's "first kiss"? Do tu think Monica and Chandler were in amor before they went to London? what is your favorito! monica and chandler moment? Monica gripped the steering wheel, trying to see the road in front of her. This wasn't the easiest task in the world. It had begun to snow an hora ago, and the solid sheet of white was blinding. Clenching her teeth, she ordered, "Chandler, honey, put the map down." Sorry it took so long, but I promise tu it's going to be worth it :) In this fic all the kids are a little older from part one, because it was easier to write it that way. Jack and Erica are three, and Emma is five. It was just after three when she got up and rushed to the bathroom for the segundo time that night from morning sickness. Chandler woke up when she layed back down. "Monica, look! Look what I found! tu gotta see!" Chandler dashed into the living room from the bedroom and jumped onto the sofá in excitement. His surprise was cleverly held behind his back. The laughter stopped when a doctor approached them "I'm Dr. Pratt" he dicho "You must be Mrs. Bing" he looked at Monica. 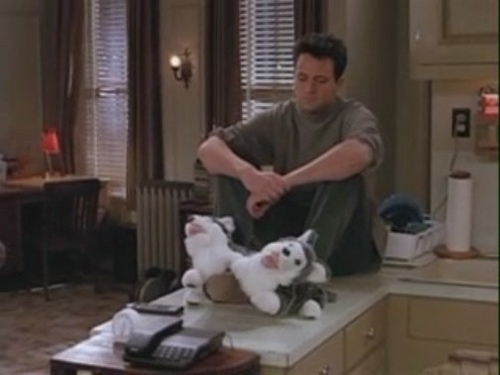 She nodded "Yes" she whispered 'How is he, ho…how's Chandler" she asked. "Well Mrs. Bing your husband has a pretty severe case of smoke inhalation" She let out the breath she didn't even know she was holding. "That's not bad right, he'll be okay" she dicho "Smoke inhalation can be quite serious a number of things are associated with it such as heat damage, asphyxiation, irritation of the lung tissues, respiratory problems and in the most severe case death"
Copyright issues: I don't own this Article, I just thought it was really good and wanted to share it with everyone. This story is pretty long so i'm going to división, split it into three parts. Monica: I still cant believe we have this house! I amor tu soo much, I wish we could just lie here all day. a pop quiz question se añadió: What did Chandler say WEENUS stood for in the episode, "The One With The Stoned Guy?" a comment was made to the poll: Who do tu think is funnier? a comment was made to the poll: Do tu like Monica o Rachael better? a comment was made to the poll: what couple do tu Lke better? What did Chandler say WEENUS stood for in the episode, "The One With The Stoned Guy?" Which songs remind tu of Mondler?